Castelnuovo Berardenga holidays offer beautiful rolling landscapes, famous vineyards and a taste of rural Tuscany. This idyllic town is perfect for a romantic break, with walking paths and quiet roads ideal for exploring, as well as some excellent cuisine paired with some of the country’s best wines. Spend your days exploring the cobbled streets of Castelnuovo Berardenga and taking in the warm sun soaked stone buildings. The Gothic monastery offers up interesting stories of the past, while a day trip into nearby Siena is a must. Here you’ll find a beautiful piazza full of restaurants and al fresco cafés, a magnificent cathedral and spectacular library with intricate frescoes adorning the walls and ceiling. The restaurants are second to none, with the luscious green landscapes of Tuscany putting fresh seasonal ingredients on the menus and expert chefs combining traditional Italian flavours with contemporary techniques. 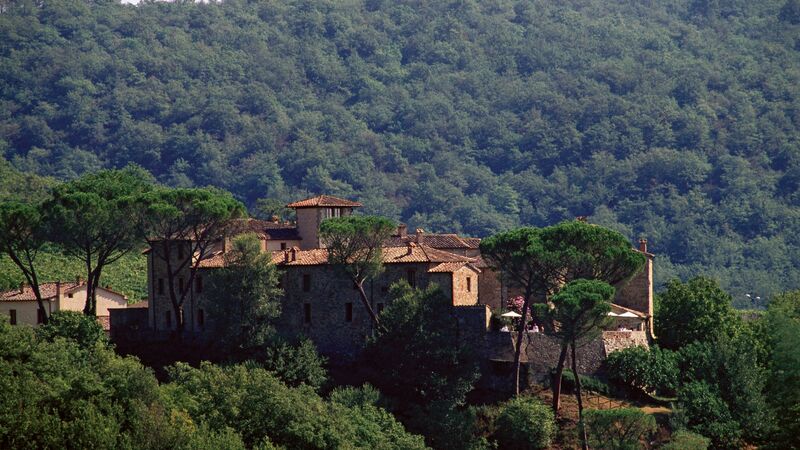 Luxury holidays in Castelnuovo Berardenga take you to the heart of Tuscany’s rural landscapes. It’s a romantic destination where you can immerse yourself in the culture of the region, with its beautiful landscapes just waiting to be explored. Take in old farmhouses surrounded by vineyards, orchards and olive groves and winding roads leading up to imposing hotels. The star attraction is the area’s wines which can be enjoyed with a winery tour and tasting led by an expert sommelier. Book your luxury holidays in Castelnuovo Berardenga with Sovereign and we’ll help you get the most from your time away. We’ve found the best hotels in the area and have tried and tested each of the properties we offer to ensure it matches up to our exacting standards, and yours. Stay at the Castel Monastero and take in views of the surrounding countryside from its hilltop location as you lounge by the pool, relax in rustic guest rooms or wander through the gardens. Castelnuovo Berardenga doubles as a springboard for exploring the Tuscan countryside. Your first stop? Neighbouring Pacina – it’s just a five-minute drive away. This hamlet is barely a speck on the map, yet it’s home to the Pieve di Santa Maria a Pacina church and one of the most original wineries in Tuscany. Before you get stuck into the local red, have a look at St Mary’s Church. Historians think it dates back to the 7th century, but these days it’s a mishmash of Romanesque towers and 19th-century vaulted aisles. Meanwhile, the 11th-century monastery doubles as an organic winery. Reds are its speciality, but the owners also make sweet Vinsanto and extra virgin olive oil. The best airports for Tuscany are Florence and Pisa. Direct flights from the UK take approximately two hours. Castelnuovo Berardenga is an hour and 20 minutes' drive from Florence Airport. Tuscany is a mild-weathered place. Temperatures meander between 20°C and 25°C in the warmest months of July and August. July is also usually the driest month of the year. Autumn is light jacket weather (around 17°C in September), while spring is crisper – think 10°C to 15°C. Tuscany has a calendar full of festivals. Museums and shops shut early on Easter weekend so that locals can join the processions and Passion Plays that pop up throughout the region. Spring also kicks off a long line-up of food events that last till autumn. September is harvest time, so that’s when wine festivals really get into their stride.